In these lessons, we will learn how to construct a 30 degrees angle from a 60 degrees angle. We can use the angle bisector to construct some other angles from existing angles. A 30˚ angle can be obtained by bisecting a 60˚ angle. A 15˚ angle can be obtained by bisecting a 30˚ angle. A 45˚ angle can be obtained by bisecting a 90˚ angle. A 22.5˚ angle can be obtained by bisecting a 45˚ angle. The figure shows a point B on a straight line. Construct an angle of 30 ˚ at point B..
Construct a 60˚ angle, and then construct an angle bisector to obtain a 30˚ angle. Step 1 : Stretch the compasses to any width. Put the sharp end of the compasses at point B and draw an arc on the line. Label the point where the arc intersects the line as point C.
Step 2: While keeping the sharp end of the compasses at point B, move the compasses away from C and draw a second arc above the line about mid-way between points B and C.
Step 3: Without changing the width of the compasses, place the sharp end of the compasses at point C and draw an arc to intersect the second arc. Step 4 : Draw a line from point B to the point of intersection of the 2 arcs. Angle ABC is 60˚. Step 5 : We now need to Bisect angle ABC. Put the sharp end of your compasses at point B and make one arc on the line BC (point S) and another arc on line AB (point T). Step 6 : Without changing the width of your compasses, put the sharp end of the compasses at S and make an arc within the lines AB and BC. Do the same at T and make sure that the second arc intersects the first arc. Step 7 : Draw a line from point B to the points of intersection of the 2 arcs. This line MB bisects . Angle MBC is 30 degrees. Constructing a 45 degree angle can be done by first constructing a 90 degree angle and then bisecting this 90 degree angle. Make sure you know how to construct an angle bisector and a 90 degree angle before you attempt constructing a 45 degree angle. How to construct a 30 degree angle using a pencil, ruler and a pair of compasses only? 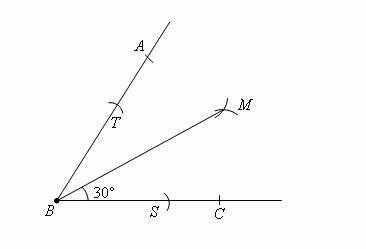 How to construct an angle of 30 and 60 degrees?